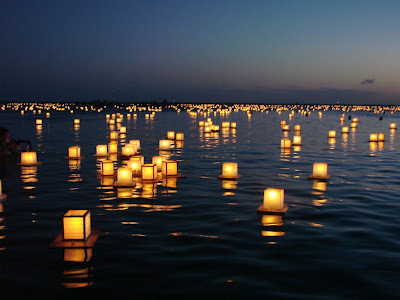 We end the Lantern Floating Hawaii (LFH12) series with a shot of the lanterns peacefully floating on the pacific ocean. Even if you have seen this event on television you should try to make it out here one year. There is just something about the atmosphere with the music and chants and the release of the lanterns that makes is a real special moment. Tips for people going next year are arrive early to get a lantern (I suggest before 4pm) and prepare to get wet as many people went waist deep to launch lanterns. This lantern is about to be launched carrying a personal message of hope and remembrance to join the 3,000 others at Lantern Floating Hawaii. Shinnyo-en (the event organizers) are dedicated to building a society free from prejudice and intolerance and in this ceremony as well as their temples through many countries they welcome everybody regardless of gender, ethnicity, religious belief, spiritual practice, political viewpoint or lifestyle orientation. All floated lanterns are retrieved after the ceremony to be recycled for use next year. Lantern’s float out to sea in the 14th Annual Lantern Floating Hawaii ceremony at Ala Moana Beach Park. 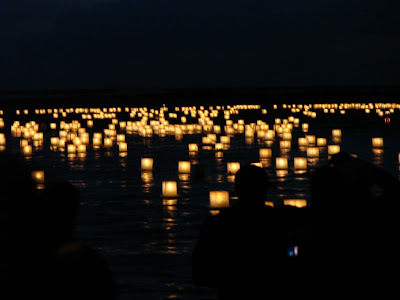 More than 40,000 people gathered to watch as more than 3,000 lanterns were released into the Pacific Ocean. 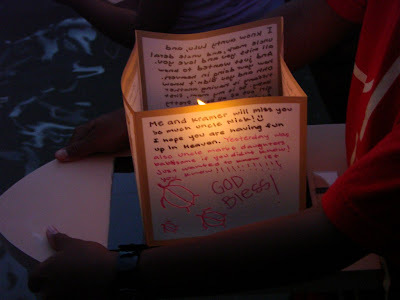 Lantern Floating allows people a personal moment to remember, reflect and offer gratitude to those who came before us. It is a collective experience where families, friends and even strangers extended warmth, compassion and understanding to one another. Lanterns float out with messages honoring loved ones who have passed away and of hope for a harmonious and peaceful future.